Right at the start of the season, a general-purpose organic fertiliser is a welcome way to wake trees back up, with an additional blanket of well-rotted compost or manure laid around ground-grown plants for good measure. 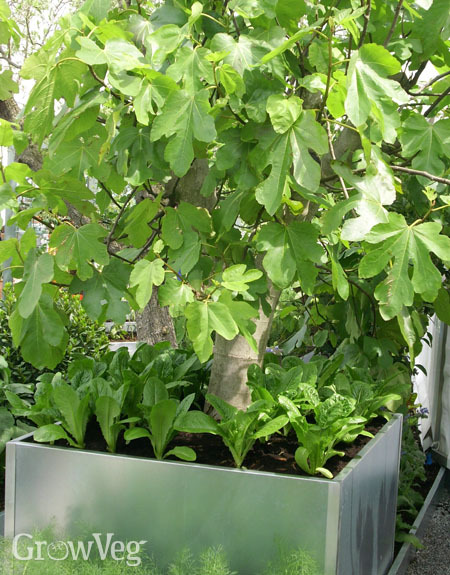 Plants need regular watering during the summer, particularly as the fruits start to swell and ripen. Apply a potassium-based liquid feed – tomato fertiliser is perfect – to give plants a boost during this period. Figs first form as tiny embryonic fruits. In cooler climates if these haven’t swollen and ripened by autumn I’m afraid they’re not going to. Any figs left on the tree at this stage won’t cross the finishing line and will drop off at the first frost. It means that any figs larger than a pea should be removed before the end of autumn. Those left on the tree will then overwinter to form next summer’s fruits. Figs served warm with yoghurt and a drizzle of honey are irresistible! The trees themselves are reasonably hardy, but the fruits are not. For this reason you’ll need to protect outdoor figs from the worst of the frosts. Horticultural fleece, or straw or bracken held in place by netting, should help to keep the young fruits safe. Remove this protection towards the end of spring as the trees burst back into life. The most decadent way I’ve found to indulge in figs is to warm them in the oven with a drizzle of honey before serving them on a cooling pillow of creamy, Greek-style yoghurt with all that honey-juice goodness poured over the top. Garden-grown figs are absolutely divine – whether grown yourself or scrounged from a long-suffering auntie!